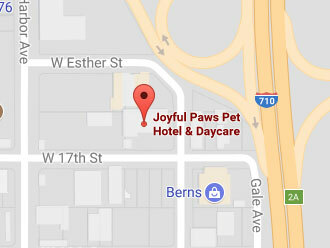 This service is meals that are provided from the Joyful Paws Pantry. We encourage parents of our guest to provide their pet’s food but, if this has been forgotten in the overnight bag we can provide this service. 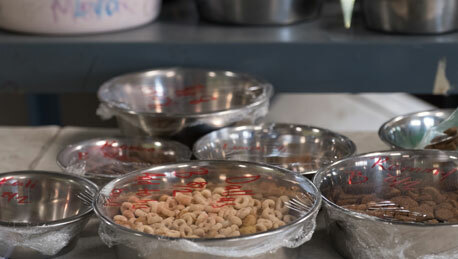 Joyful Paws Pantry is stocked with food from Whole Earth Farms, a grain-free limited ingredients diet formula. This service is charged on a per meal basis. While your pet is visiting with us you’ll receive a daily photo and report card, giving you peace of mind pet care. Joyful Paws staff can administer topical and oral medication, vitamins and supplements. If your pet’s vaccines have expired and you haven’t had the time to take them to the Vet’s office, we can help! We will shuttle your pet to the vet for vaccines or anything else you may want to schedule. The primary Vet Joyful Paws uses for vaccines is Primary Care Animal Hospital, if you prefer us to use another vet additional transportation charges may apply. Keep an eye on your love while at work for extra piece of mind.